I have purchased a built-in navigation system. Is it possible to purchase any navigation software for it? Please check whether iGO 8 (v.8.3) based CarteBlanche Navigator software has been tested with your navigation device. Send a corresponding request to our technical support service. It might be needed to bring the device to our office to test its compatibility with iGO software. How can I check if a navigation software is licensed? Each navigation software has a menu page with the information about the maps including the relevant copyrights as well as a page with the information about the license and the unique license code. If there are no such information pages in the menu, or if there is a word DEMO, BETA or Worldwide in the name of the license, it means that the software product is illegal. Such products can not be updated on www.naviextras.com and are not provided with any other technical support. Please make sure that the software is licensed before purchasing a navigation device. Can I make a backup copy of the SD memory card content? Yes, you can. It is recommended to make a backup copy of the SD card content and to save it on your PC hard drive and/or on a compact-disk or DVD. In case of any memory card operation failure you will be able to format the card and to write the saved backup copy to it. To format the SD card the site recommends to use Panasonic SDFormatter software (free of charge). The User’s Manual for this program in English is available for download. Is it possible to purchase the map of only one city/district? In iGO 8, CarteBlanche Navigator, iGO Amigo, iGO Primo software the map file includes the coverage of the whole territory of one or another country (except the USA, where it concerns individual states). That is why the maps of individual cities or districts do not exist. These maps are included into the map of the country. Is it possible to purchase the maps of other countries in addition to the map of Ukraine? Yes, in some cases this ugrade is available. Refer to How to update the maps for iGO 8 software for PDAs and PNDs based on iGO 8.0/8.3? for details. What is the Smart Keyboard? When searching an address, after each character is entered the software automatically analyses all the possible word variants and highlights (keeps active) only the available keys, so that the search can be continued only among the existing names. What is the Automatic Route Recalculation? If you have activated a certain route in your navigation device, and then had to deviate from it (for example, because of the road works or traffic jams), it is not needed to create a new route as it will be recalculated automatically as soon as the software indicates a deviation from the route planned earlier. What is the Smart Zoom? The Smart Zoom will automatically change the scale of the map so as to give the best view of both turns or intersections (by enlarging the scale and making the plan of an intersection more detailed) and straight route segments (the scale becomes smaller to show the whole segment of the route up to the following turn). The scale may also be changed manually. Why do I have a map with Latin letters? If your map version is older than 2013.03, please update the map to the latest version. Starting from the version 2013.03, the map of Ukraine is displayed in Russian if the Russian interface language is selected; in addition, address and POI search in Russian is added. In the earlier versions the standard iGO principle was applied, i.e. the map was displayed in the local language if this language was selected for the interface, and in the Latin alphabet (transliterated from Ukrainian) if any other UI language was selected. Is there any possibility to have traffic jams shown on the map? Yes, iGO software supports TMC service. However, at the moment the TMC system does not work in Ukraine. TMC (Traffic Message Channel) is a technology created to keep the driver informed about the road traffic situation. The TMC signal carries specially coded information on the traffic intensity, time and place for each segment of the road network through FM transmitters, through the DAB (Digital Audio Broadcasting) system or through satellite radio signal transmission. These messages are decoded by special TMC-receivers connected to the navigation device. The driver will see the information on the traffic intensity on the device screen. As a rule, TMC is a paid service. However, the TMC system does not work in Ukraine yet. Where can I find the list of map versions with indicated map coverage? A detailed manual for the iGO 8 application. I have a GPS navigation device which has been purchased abroad. The maps of Germany, Switzerland and Austria are installed on it. I would like to install the map of Ukraine with detailed cities as well. I tried to find the maps in the Internet but failed. Is there any solution? If there are no maps for my device, is it possible to reinstall the system? Please send the corresponding request to our technical support. It might be necessary to bring the device to our office for testing its compatibility with iGO software. How can I define which program is installed on my navigation device? 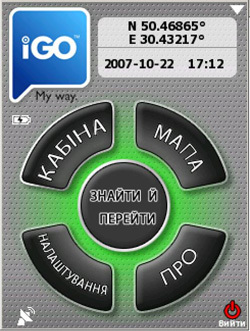 To define which program is installed on the navigation device turn on the device, run the navigation software and compare the main menu screen with the screenshots provided on iGO My Way 2006 Plus and iGO 8. 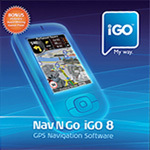 How to update the maps for iGO My Way 2006 Plus software for PDAs and the software for PNDs based on iGO 2006/2006 Plus? The map of Ukraine for iGO My Way 2006 Plus for PDAs and the software for PNDs based on iGO 2006/2006 Plus can be updated through the technical support service in our office. As NNG company, the manufacturer of iGO My Way 2006 Plus software has announced that the technical support and the map updates for this product are discontinued since October 2009, it is only possible to update the map to the version 2009.02. 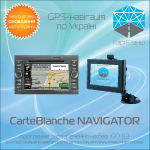 However, provided that your navigation device is compatible with iGO 8 software for PDAs under Windows Mobile or CarteBlanche Navigator software for PNDs and in-car multimedia systems, you may purchase the newer navigation software version with the most up-to-date map of Ukraine. 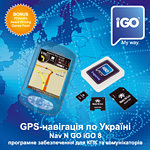 How can I update iGO My Way 2006 Plus software if I live outside Kyiv? Unfortunately, it is possible to update the map of Ukraine in our office only. If you live in another city, you have to send the SD card with the navigation software to our office by any delivery service. Please indicate your contact telephone number and/or e-mail address. After updating the software we will send the SD card back to the address agreed with you on collect on delivery terms. How to update the maps for iGO 8 software for PDAs and PNDs based on iGO 8.0/8.3? The software and maps for iGO 8 both for PDAs and PNDs based on iGO 8 can be updated on the site www.naviextras.com/shop/portal. The list of devices which can be updated on this portal. A Manual for updating software and maps in English is available. The translation of this Manual into Ukrainian can be found on our site. Are passages between buildings, building footprints and numbering displayed on the map? Please see the list of map versions with the description of changes. Are house numbers with letters and fractional numbers supported by the software? In iGO 8, CarteBlanche Navigator, iGO Amigo software the European house numbering system is used, which does not fully correspond with the Ukrainian reality. The house numbering system with fractions or letters is not supported. To find such house number please search by the first number in the combination. Please copy the text file corresponding to the safety cameras to the folder SD/iGO8/content/speedcam. Please tick the Menu –> “Settings” -> “Warnings” -> “Speed Camera Warning”. Choose the preferred modes of audible and visible warnings in the field near “…”. I have a built-in 2 DIN navigation system Phantom (Challenger) with iGO 2006 Plus software. The on-screen buttons for returning to the previous page do not work. What is the reason? These multimedia systems have 2 levels of screen calibration. To remedy the situation please restart the system by pressing the “Reset” button or removing the ignition key from the lock, waiting for a minute and reinserting the key. After the system is started please go to the navigation page immediately by pressing the hardware “Nav” button and, as soon as the picture with on-screen buttons “Navi” and as soon as “Adjust” appears, press the “Adjust” screen button before a symbol of a sandglass appears. Recalibrate the screen once more. If this method does not help, please contact our technical support service. I have a Challenger GN-40 navigation device with iGO 2006 Plus software. When the program is started a message «The application does not exist» appears and nothing else happens. Reset does not help. What should I do? Such message may appear if the device’s power supply is switched out without exiting the navigation program before. Please contact our technical support service. I can not install iGO 8 onto Asus May Pal 686 PPC with Windows Mobille 6.0. The screen has become dark. iGO 8 fails. What should I do? Not less then 30 MB of free RAM memory is needed for the software operation. Please check (Start -> Settings -> System -> Memory) the free memory volume and if needed close all the started programs on the PNA (Start -> Settings -> System -> Memory -> Active Programs). Attention! The X icon in Microsoft® Windows Mobile™ operation system means collapsing the program, not closing it. I have a GPS navigation device which has been purchased abroad of Ukraine. The maps of Germany, Switzerland and Austria are installed on it. I would like to install the map of Ukraine with detailed cities as well. I tried to find the maps in the Internet but failed. Is there any solution? If there are no maps for my device, is it possible to reinstall the system? Are iGO 2006 Plus and iGO 8 applications compatible with the devices based on the Symbian OS? No, iGO My Way 2006 Plus and iGO 8 applications are compatible only with the devices under Windows Mobile OS (PDAs, smartphones) or Windows CE.NET (special software versions for each navigation device). There are also iGO versions for Android and iPhone. The List of Compatible Devices (iGO 8). System Requirements of iGO 8. I tried to purchase a map of Europe for iGO 8 (CarteBlanche Navigator) software installed on a 2GB SD card through www.naviextras.com, but a message was displayed that there is not enough free memory. What should I do? Please read the Toolbox Guide carefully. Following this Guide, please make a backup copy of the largest files on your PC hard drive and delete them from the SD card. Make sure to delete individual files only and keep the initial folder structure. Most often the largest files are the ones from iGO8/content/lang (menu languages), iGO8/content/dem (3D elevation model), iGO8/content/map (the map files) folders. During the update process, additional memory on the SD card is needed for uploading the temporary map file copies. When the update is completed, you will be able to copy all or a part of the deleted files back to the SD card from the backup copy.